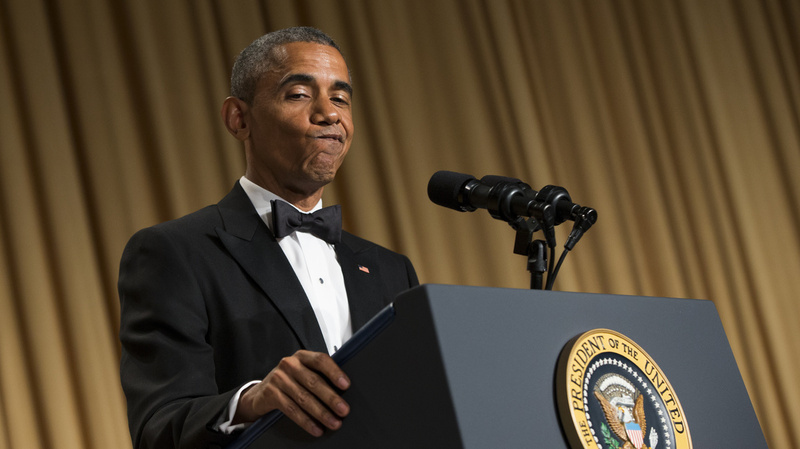 8 Obama Jokes That Stood Out From The White House Correspondents Dinner : It's All Politics Every year, the president sits down for dinner with Washington reporters and delivers a standup routine. From his "bucket list" to Hillary Clinton, here's what he came up with this year. President Obama during his speech at the White House Correspondents' Association dinner in Washington, D.C., Saturday night. 2. Those Gray Hairs: "I look so old John Boehner's already invited Netanyahu to speak at my funeral." He also lamented that he has so much to do, like negotiate with Iran, "all while finding time to pray five times a day." President Barack Obama brings out actor Keegan-Michael Key from Key & Peele to play Luther, Obama's "Anger Translator" during the White House Correspondents dinner. 3. "Arrogant And Aloof": "People say I'm arrogant and aloof," the president said. "Some people are so dumb." 4. End of Times: "Michele Bachmann predicted I would bring about the biblical end of days. Now that's big. ... Lincoln, Washington — they didn't do that." 5. Hillary Clinton: The economy's gotten so bad for some people, Obama said, "I had a friend, just a few weeks ago, she was making millions of dollars a year, and now she's living out of a van in Iowa." 6. The 2016 GOP Field: "The Koch brothers think they need to spend a billion dollars to get folks to like one of these people," Obama said of the potential 2016 Republican presidential candidates. "I raised a lot ... but my middle name is Hussein." 7. Reach Out And Touch A Veep: Talking about how close he and Vice President Biden have gotten, especially in stressful times, Obama joked that he loves Biden's back massages. "Those Joe Biden shoulder massages are like magic. You should try one." [Pause.] "Oh, you have?" He added, "We've gotten so close, in some places in Indiana, they won't serve us pizza anymore." 8. A Third Obama Term (Sorta): Talking about how much he liked Bernie Sanders, I-Vt., who could run for the Democratic nomination for president: "Apparently people really want to see a pot-smoking socialist in the White House. We could get a third Obama term after all."